Sun and blue sky Easter Monday in Berlin. No snow today. A national holiday. Snowing in Berlin – Easter morning. A wet snow. Cheerful colored eggs hanging on branches remind us it’s Spring. Happy Easter. What I discovered is I shoot a lot of red. I blurred my eyes to spot purple in the archives. The one pictured is not spiked and no one ate it either. It is still in my freezer to slice and photograph with light coming through the jello like stained glass. Purple views, white balance setting askew but it works for the challenge. A bit too much sunlight on the eggs but they were a reddish color. My sister made these beautiful colored eggs. She peeled the paper skins off a mesh bag of yellow onions, down to the onion part. Boiled the eggs and skins together slowly for a long time. 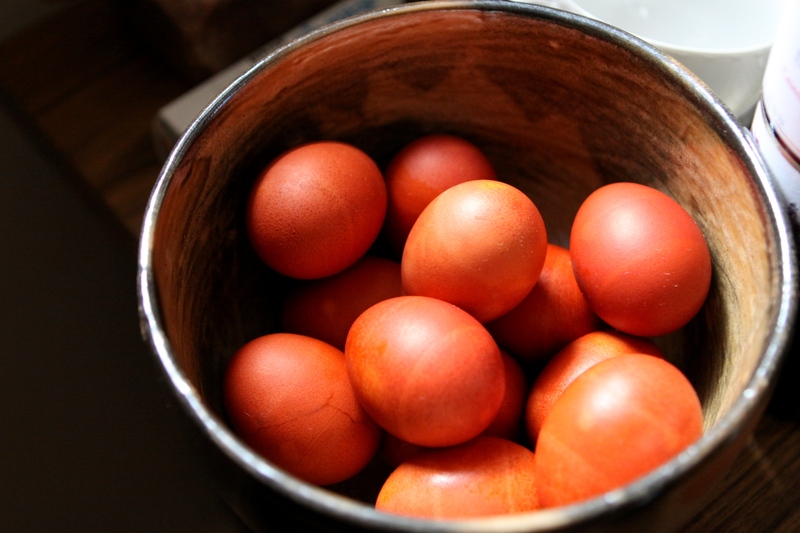 The eggshells became a rich reddish color. After the dinner on Monday we played the egg game, trying to crack the other person’s egg with yours. Fredi suggested using the smaller tip like a torpedo. His coaching worked for me and my egg was the winner, although the other guests might have felt it fixed, with the hostess’s sister winning! You win if your egg remains uncracked at the end of the game. Mary said it had Armenian and Greek roots (the egg game.) A competitive group!